Check out our great special offers below and be sure to come back soon as we’re constantly working to bring great deals like these to our valued customers. The POCD Scientific Pipette Trade-in/Trade-up program lets you trade-in or trade-up any brand/any condition pipette for a new one. Full details are available on the flyer below, simply click the button to view or download. Purchase 1 Ripette® Pro repetitive dispenser and get 2 cases of RITIPS® STANDARD (of your choice) for free. 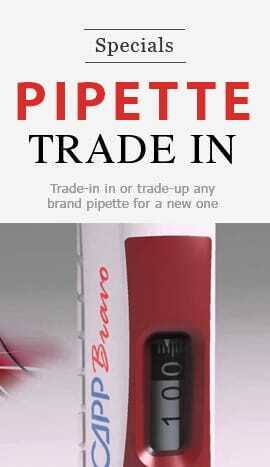 Purchase 1 × Single Channel Pipette and receive 1 ×l case of tips of you choice, free of charge! Purchase 4 × Pipettes of your choice and receive 1 ×l pipette stand for free. POCDS is pleased to introduce the NEW CAPP range of tips and tubes, manufactured in Germany in clean rooms and certified to be RNase, DNase DNA and Pyrogen free at an incredible low price. Purchase a LMC-3000 laboratory centrifuge and receive a rotor of your choice, free of charge!